The system that produced cirrus to obscure satellite-based observations of low clouds and fog over the Southeast US on 29 October (link) had the same effect over the Northeast United States: Multiple Cloud Layers with an extratropical system will prevent satellites from identifying regions of low clouds and fog. Any kind of fog detection algorithm, then, must incorporate surface-based observations (as in a model, for example) to provide useful information when multiple cloud layers are present. WFOs in the northeast issued Dense Fog Advisories for the morning of 29 October (and retweeted fog images from the public). (Link) The animation above shows the evolution of GOES-based GOES-R IFR Probabilities and GOES-13 Brightness Temperature Difference fields. Little information can be gleaned from the brightness temperature difference fields; however, the IFR Probability does show high probabilities where IFR and near-IFR conditions develop from coastal Massachusetts northeastward through coastal Maine. The flat character of the IFR Probability field occurs because Rapid Refresh model data are being used as predictors in the computation of IFR Probability, and those model fields do not vary quickly. When satellite data are also used — as over Quebec at the start of the animation — the IFR Probability fields have a pixelated character. IFR Probabilities increase on the last frame of the animation. This occurs because the region becomes sunlit, and cloud-clearing abilities increase. The algorithm to compute IFR Probability therefore has greater confidence that clouds are present and probabilities increase. This entry was posted in Multiple Cloud Layers, New England on October 29, 2014 by Scott Lindstrom. On the morning of 28 October 2014, Fog developed over the southeast under clear skies. On the morning of 29 October, Fog developed under cirrus clouds. When cirrus clouds are present, the brightness temperature difference product gives no information on low clouds, and the GOES-R IFR Probability fields rely on model data only to provide information. The toggle above shows IFR Probability Fields that overlap the region of reduced ceilings/visibilities in coastal South Carolina. Because model data are the primary predictor used, the field is much smoother (less pixelated) than when satellite data can also be used as a predictor. This entry was posted in Multiple Cloud Layers, Southeast on October 29, 2014 by Scott Lindstrom. 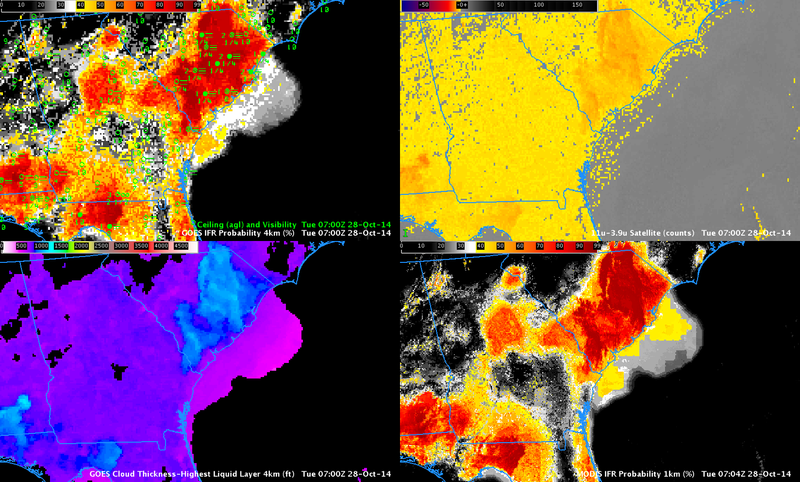 Fog and low ceilings developed over the southeast United States during the morning hours of 28 October 2014. The animation above, showing data each hour, shows IFR Probabilities developing initially near Charleston South Carolina then overspreading much of South Carolina, Georgia and Mississippi. In contrast, the brightness temperature difference field has a positive signal over most of those states. IFR Probability correctly screens out regions where Brightness Temperature Difference suggests low clouds are present but where ceilings and visibilities do not meet IFR criteria. IFR Probabilities are highest where the brightness temperature difference signal has the largest value, however. The animation includes one hour (0700 UTC) with a MODIS-based IFR Probability field, shown below. MODIS- and GOES-based fields show similar patterns, but edges are sharper in the higher-resolution data. Suomi NPP overflew the southeast in the early morning as well. The toggle below of the Day Night Band and the Brightness Temperature Difference shows two things plainly: The near-New Moon has not yet risen and lunar illumination is missing; therefore, only Earth-glow and City Lights are providing light, and clouds are very difficult to detect. As with GOES data, the Suomi NPP Brightness Temperature Difference field overpredicts where low clouds and fog and creating IFR conditions. GOES-R Cloud Thickness Fields can be used to predict when fog will burn off (Using this scatterplot as a first guess). 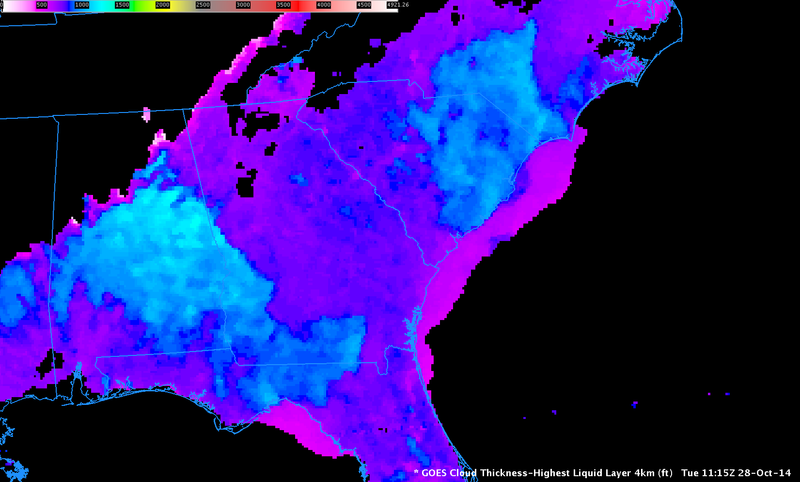 The image below is the last pre-sunrise GOES-R Cloud Thickness field over the Southeast. The Thickest clouds are over east-central Mississippi and central North Carolina, so that is where fog should linger the longest. The short animation, at bottom, showing the 1415 and 1515 UTC shows that to be the case. Note that fog/low clouds over Mississippi are moving eastward and lingering, perhaps because the high clouds above them are reducing insolation. This entry was posted in MODIS, Southeast on October 28, 2014 by Scott Lindstrom. GOES-R IFR Probabilities are created using both GOES-15 Imager and Terra/Aqua MODIS. The toggle above shows MODIS-based IFR Probabilities (computed using data from Aqua and the Rapid Refresh) and GOES-based IFR Probabilities (computed using data from GOES-15 and the Rapid Refresh). There are three regions in the fields that warrant comment. (1) Over East-central Alaska and the Yukon, large values of MODIS-based IFR Probabilities are limited in area (and near stations — such as Northway Airport — that are reporting IFR or near-IFR conditions). GOES-based IFR Probabilities in that same region include a large area with modest values — around 50%. Limb brightening may have an effect at high latitudes on the brightness temperature difference fields that are used in the computation of IFR probabilities because limb brightening is a function of wavelength. MODIS data (which will have far less limb brightening) can be used as a good check on the IFR Probabilty fields computed from GOES. (2) Over Southwestern Alaska, and into the eastern Aleutians, GOES-based and MODIS-based IFR Probabilities are very similar. In this region, multiple cloud layers prevent satellite data from being used as a predictor in the computation of GOES-R IFR Probabilities. Rapid Refresh data is the main predictor for low clouds/fog, so MODIS-based and GOES-based fields will look similar. (3) In the northeastern part of the domain, over the Northwest Territories of Canada, MODIS-based and GOES-based IFR Probabilities are very high. Satellite data are being used as a predictor here, and the satellite-based signal is strong enough to overwhelm any limb-brightening. (Note that southern Northwest Territories and northern British Columbia are south of the MODIS scan). Terra- and Aqua-based MODIS observations yield frequent observations that result in good spatial and temporal coverage for IFR Probability fields over Alaska. GOES-15 temporal coverage is better, but the frequent MODIS passes can be used to benchmark GOES-based IFR Probability fields that may be misrepresentative because of limb-brightening effects at high latitudes. This entry was posted in Alaska, Error Explanations, MODIS on October 27, 2014 by Scott Lindstrom. When a baroclinic system moves through a CWA, drops precipitation and then exits after sunset, the stage is often set for the development of radiation fog. The animation above cycles through the 0615 UTC imagery: GOES-13 Water Vapor (6.5 µm), GOES-13 Brightness Temperature Difference (10.7µm – 3.9µm) and GOES-based GOES-R IFR Probabilities. The upper-level reflection of a surface cold front moving through eastern Nebraska and western Iowa (link) is obvious in the (infrared) water vapor imagery, and also in the brightness temperature difference field. The difficulty that arises with multiple cloud layers that invariably accompany these systems is that the mid- and high-level clouds do not allow for an accurate satellite-only-based depiction of low stratus and fog. GOES-R IFR Probabilities allow for that kind of depiction because near-surface saturation is considered in the computation of IFR Probabilities (using data from the Rapid Refresh Model). Thus, IFR Probabilities correctly suggest the presence of reduced visibilities over extreme northwestern Iowa and they alert a forecasters to the possibility of fog over much of western Iowa. The animation of GOES-R IFR Probability fields, above, shows the steady increase in probability that accompanied the reduction in ceilings and visibilities. The character of the IFR Probability fields is testimony to the data that are used to create them. The fairly flat fields over Iowa early in the animation mean that satellite data cannot be used as a predictor (because of the multiple cloud levels that are present there, as apparent in the animation below). Instead, the model fields (that are fairly flat compared to satellite pixels) are used and horizontal variability in the field is small. In addition, IFR Probability values themselves are somewhat smaller because fewer predictors can be used. 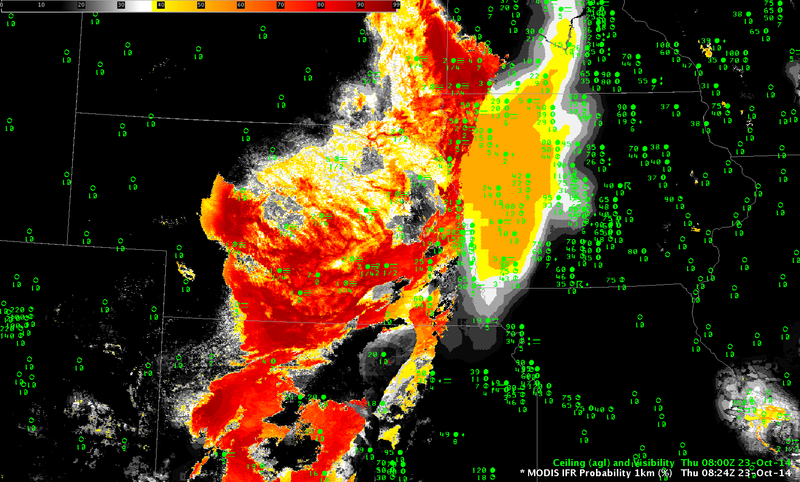 IFR Probabilities are more pixelated in nature over southern Nebraska where satellite-based predictors could be used. IFR conditions are widespread in that region where IFR Probabilities exceed 90%. Note how IFR probabilities are smaller over Kansas, in a region of mid-level stratus (but not fog). The brightness temperature difference field there maintains a strong signal. IFR probability fields do a superior job of distinguishing between mid-level stratus and low stratus/fog (compared to the brightness temperature difference field). This is because a mid-level stratus deck and a fog bank can look very similar from the top, but an accurate Rapid Refresh model simulation of that atmosphere will have starkly different humidity profiles. At 1400 UTC (below), the rising sun (and its abundant 3.9 µm energy that can be easily scattered off clouds) causes the sign of the brightness temperature difference field to flip. (Compre the 1400 UTC Brightness Temperature Difference Field below to the final Brightness Temperature Difference field (1300 UTC) in the animation above!) However, the IFR Probability field maintains its character through sunrise. MODIS-based IFR Probability Fields were also available for this event, at 0824 UTC, below. As with the GOES, there is a noticeable (very!) difference between regions where Satellite Predictors are being used in the computation of IFR Probabilities (Nebraska) and regions where Satellite Predictors are not being used in the computation of IFR Probabilities (Iowa). The superior resolution of the MODIS data also suggests that River Valleys in eastern Nebraska are more likely foggy than adjacent land. The Elkhorn River between Norfolk and O’Neill, for example, shows up in the MODIS-based IFR Probability field as a thread of higher IFR Probability. This entry was posted in MODIS, Multiple Cloud Layers, Plains on October 23, 2014 by Scott Lindstrom. The toggle above, of Brightness Temperature Difference and GOES-R IFR Probabilities, shows how the traditional method of fog/low stratus detection — brightness temperature difference fields — can overpredict where fog and low stratus are actually observed. There are two main reasons for this: First, in regions of dry soil (over the Desert Southwest, for example), emissivity differences in soil can trigger a large difference in satellite-perceived brightness temperature at 10.7µm and 3.9µm that leads to a fog-like signal; second, in regions of water-based clouds, the signal is for the cloud top only. The satellite signal gives little information about the thickness of the cloud or of the cloud base. In the example above, mid-level stratus over central Kansas southward through central Oklahoma into central Texas yield a brightness temperature difference signal similar to regions of low clouds over the northern Texas panhandle. Compare the observations at Dalhart TX (KDHT) and Alva, OK (KAVK), for example. The fused product (GOES-R IFR Probabilities) yields a statistically superior picture of the region of low stratus and fog because of the use of Rapid Refresh Data. These model data include the effects of surface-based observations and can therefore screen regions where low clouds are not actually present. GOES-R IFR Probabilities therefore give a better estimate of exactly where the low clouds present a hazard to — for example — aviation. This entry was posted in Plains on October 23, 2014 by Scott Lindstrom. Fog and stratus developed overnight over the Ozark Mountains and southern Plains. The hourly loop of GOES-R IFR Probabilities shows the development and expansion of visibility and ceiling reductions over the area. How do these fields compare to other measures of fog? 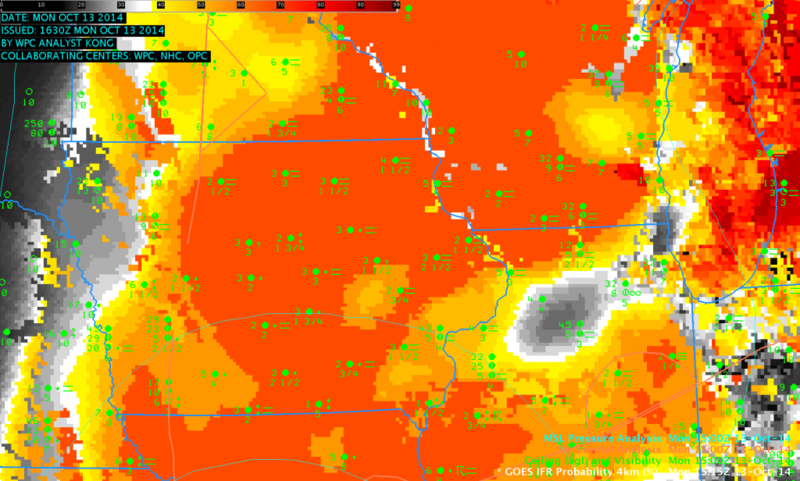 Brightness Temperature Difference fields, below, generally overestimate the regions of fog. The 0200 and 0800 UTC brightness temperature difference fields, below, are toggled with the IFR Probabilities; the inclusion of surface information via the Rapid Refresh Model correctly limits the positive brightness temperature difference to regions where fog and low stratus are most likely. The satellite-only signal overpredicts regions of reduced visibilities because it can only see the top of the cloudbank; this offers little information about the cloud ceilings! Brightness Temperature Difference fields are occasionally contaminated by stray light in the signal. This happened on 21 October at 0400 UTC. The Brightness Temperature Difference fields at 0345, 0400 and 0415 UTC are shown below, with the GOES-R IFR Probabilities for the same time follow. Note how Stray Light contamination does bleed into the GOES-R IFR Probability field; if there is a large change over 15 minutes in the IFR Probability signal, consider the possible reasons for that change. Stray light contamination is a strong candidate if the signal is near 0400-0500 UTC with GOES-East. There are regions in the IFR Probability fields where even the strong — but meteorologically unimportant — brightness temperature difference signal during stray light is not enough to overcome the information from the Rapid Refresh model that denies the possibility of low-level saturation (for example, in northern Kansas or southern Oklahoma). MODIS data from either Terra or Aqua can give important early alerts to the development of Fog/Low Stratus. Because of its superior resolution to GOES, the character of the developing fog can be depicted with more accuracy. The MODIS-based IFR Probability, below, in a toggle with the GOES-based IFR Probability at the same time, distinctly shows that the fog development at 0430 UTC is starting in the small valleys of the Ozarks of northwest Arkansas. GOES-based IFR Probabilities give a broader signal; certainly if you are familiar with the topography of the WFO you can correctly interpret the coarse-resolution GOES data, but the MODIS data spares you that necessity. This entry was posted in MODIS, Plains, Stray Light, Suomi/NPP on October 21, 2014 by Scott Lindstrom. Strong low pressure systems can cause IFR conditions over large areas, but the multiple cloud layers that accompany extratropical cyclogenesis make difficult the observation of low stratus, because higher cloud decks are invariably in the way of the satellite’s view. For such systems, inclusion of Rapid Refresh Data as a way of detecting low-level saturation is a must. In the imagery above, note that the highest IFR Probabilities are between the warm front (that emerges from the low in Missouri and stretches into Illinois and Indiana) and the trough that extends north of the low in Missouri. 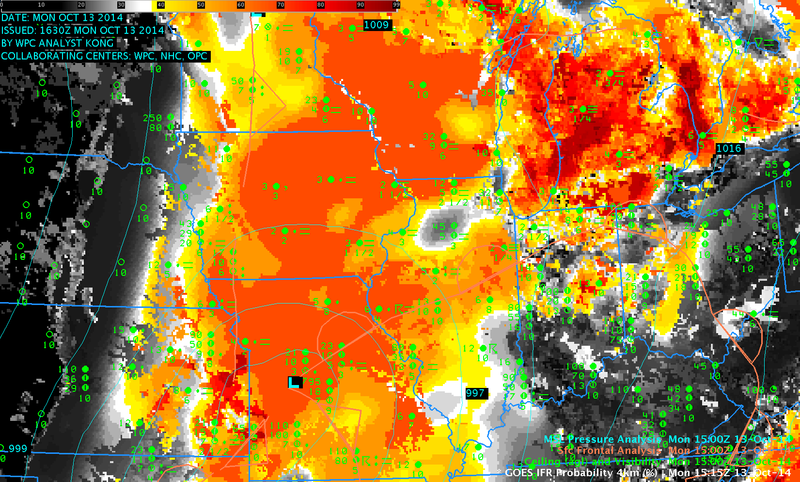 A zoomed-in view of the above image, below, centered over Iowa, does show good spatial correlation between observed IFR conditions and high IFR Probabilities. This suggests that the Rapid Refresh Model is accurately simulating the evolution of the strong storm in Missouri. This entry was posted in Midwest, Multiple Cloud Layers on October 13, 2014 by Scott Lindstrom. (A Blog post on Suomi NPP Imagery over the western US from 10 October is available here). Polar orbiters typically don’t give good temporal resolution, especially near the Equator. In mid-latitudes, however, Polar Geometry can yield views over a wide area on two successive scans. This happened along the West Coast early in the morning on 9 October. Two regions show noticeable changes in stratus between the two times: stratus/fog extends farther down the Salinas Valley at the southern edge of image, and stratus/fog expands over southwestern Puget Sound in Washington. The Brightness Temperature Difference field (11.35µm – 3.74µm) from Suomi NPP for the same times shows a similar evolution over the Salinas Valley, but the view of Washington is obscured by thin cirrus. These cirrus (that show up as black enhancements below) are mostly transparent in the Day Night Band but not in the infrared bands. MODIS instruments onboard Terra and Aqua yield spectral data that can be used to generate GOES-R IFR Probability Fields. The animation below shows high-resolution imagery of where IFR Probabilities are highest, but only at three distinct times: 2152 UTC on 8 October and 0537 and 0949 UTC on 9 October. An increase in IFR Probabilities around Monterey Bay is apparent (and consistent with the Suomi NPP Observations above); IFR Probabilities also increase along the Oregon Coast and around Puget Sound. How do GOES-based observations complement the Polar Orbiter data above? The hourly animation above shows the slow increase of IFR Probability in/around Monterey Bay, and also a push of higher IFR Probability onto the Oregon Coast that occurs after the last MODIS-based IFR Image shown farther up. (Higher IFR Probabilities also spill into San Francisco Bay). Do surface observations of ceilings and visibilities agree with the IFR Probability fields? The loops below, from Oregon (below) and Monterey Bay (bottom) suggest that they do. For example, Eugene OR (and stations north and south of Eugene) show IFR conditions as the high IFR Probability field moves in after 1100 UTC. GOES-based data is valuable in monitoring the motion of IFR Probability fields; keep in mind, though, that small-scale features may be lost. For example, it is difficult for GOES to resolve the Salinas Valley. This entry was posted in California, Day/Night Band, MODIS, Pacific Northwest, Suomi/NPP on October 9, 2014 by Scott Lindstrom. MODIS data from Terra and Aqua, Suomi NPP data, and GOES-15 data yield different types of information that can be used to observe clouds in a region. Probabilities of IFR conditions — that is, what’s going on at cloud base, which is a part of the cloud the satellite cannot see — can be produced by combining satellite observations of cloud tops and data from a model (such as the Rapid Refresh) that includes accurate predictions low-level moisture. The three MODIS images, above (bottom right), show the slow encroachment of higher IFR Probabilities east-southeastward along the Sonoma/Marin county border. The high-resolution imagery from MODIS allows a more accurate depiction of the sharp edges that can occur as marine stratus penetrates inland around topographic features. MODIS data also suggests reduced ceilings in San Francisco. Suomi NPP overflew California at 1000 UTC, and those images are below. 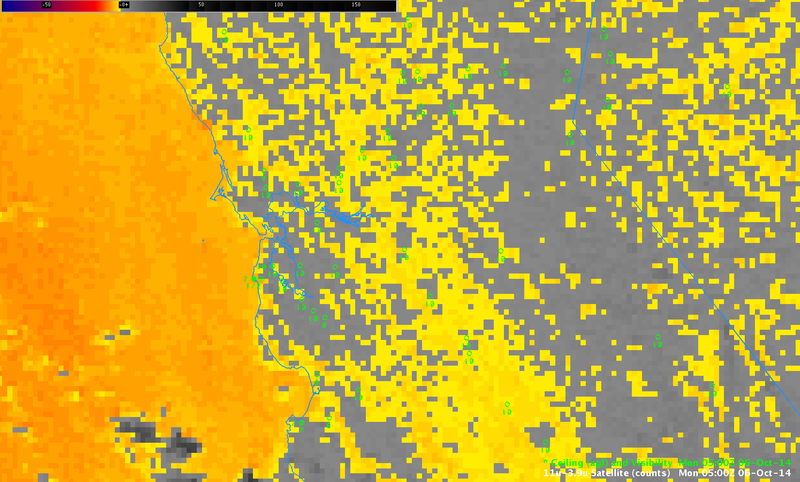 The brightness temperature difference field, and the Day Night band show clouds offshore, and city lights in and around San Francisco Bay and Monterey Bay. Regions of stratus have moved inland towards southern Sonoma County, over San Francisco, and over Monterey. There is a slight brightness temperature difference signal in the Suomi NPP data that extends down the Salinas Valley as well; it’s difficult to perceive cloudiness in the Day Night band in that region however. The great strength of GOES data is its ability to monitor continuously the West Coast. Trends are therefore more easily observed. The hourly loop, below, shows that along much of the west coast, marine stratus stayed off shore through the night. Higher IFR Probabilities are also confined to regions where ceilings and visibilities were reduced. This is an improvement on the brightness temperature difference fields for the same time that have strong signals over much of the central Valley (for example, at 0500 and 1300 UTC, as well as at 0915 UTC, above). This entry was posted in California, Day/Night Band, MODIS, Suomi/NPP on October 6, 2014 by Scott Lindstrom.